This is my story of my journey through Ladakh, a remote and beautiful part of India, nestled high amongst the peaks and valleys of the Himalaya. In Part 1, I shared my experiences from the first part of my trip from Leh to Kargil and on through Suru Valley. 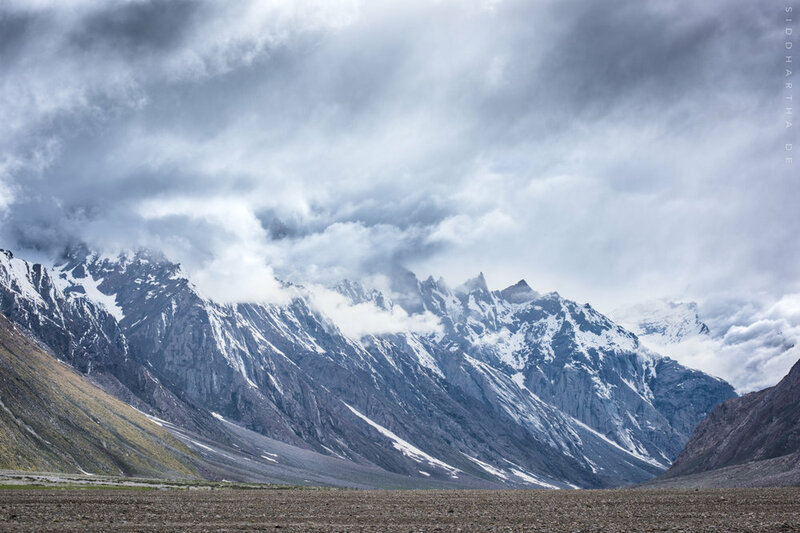 From here, we journeyed deeper and higher into the heart of Ladakh, into the harsh, windswept, bleak landscapes of Zanskar, the Virgin Vale. 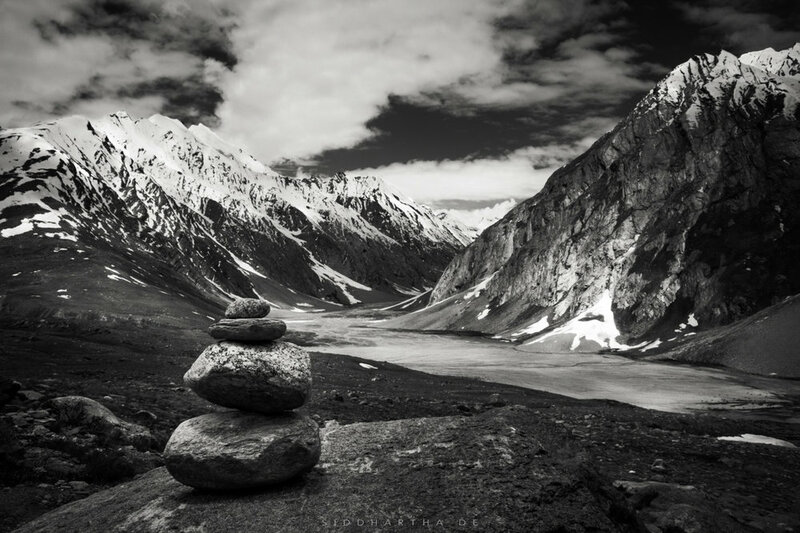 Although fed by the same river system, the Suru and Zanskar Valleys are markedly different from each other. While the Suru Valley is verdant and fertile, and dotted with farms and flowering meadows in the shadows of its towering peaks, the Zanskar Valley is higher and mostly barren, with a few flowering plants, grasses and shrubs clinging precariously to its rocky mountainsides or to the edges of alpine lakes formed by glacial melt. 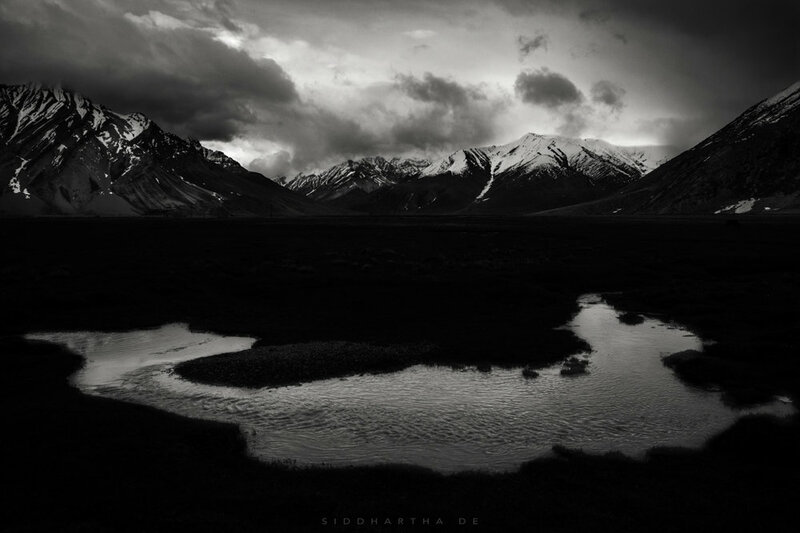 More than once I was reminded of the volcanic landscapes of Iceland, although the sheer scale of Ladakh needs to be seen to be believed. The Himalaya are something else. We drove for the better part of the day to Rangdum (elev. 13,000 feet), stopping at various places along the way to take in the unbelievable vistas laid out before us. It was at this time that the soles of one of my shoes took the inopportune decision to separate from its upper half, from the heel to almost halfway along to the toes. I only had one pair of shoes, thanks to airline regulations in India allowing only 15 kg of checked-in baggage (naturally, I prioritised camera equipment over footwear), they sounded like flip-flops every time I took a step, and I wasn’t sure if they would last the trip. I went over to the kitchen gang and asked them if they had anything that could help me. They said no, but added that I needed Elfy. Elfy? Elfy. I had no idea what Elfy was. Elfy? Elfy. I had no idea what Elfy was. We reached Rangdum in the late afternoon and stopped to have some chai at a small hotel before we proceeded to set up camp. Rangdum is a little village near the foot of a hill dominated by the Rangdum monastery. The hill on which the gompa is situated is itself dwarfed by the sugar-dusted peaks behind it. We made camp a couple of kilometers beyond the village and settled in for the evening. We had a hearty dinner, after which the skies started clearing, bringing the promise of some good Milky Way shots later that night. It was getting steadily colder with the increasing elevation, and more and more difficult to stand in one place and keep shooting. But standing in the cold was worth it because we came away with some spectacular shots. The next morning dawned bright and clear and cold. It is quite a change to wake up, look out of your ‘bedroom’ window and see an uninterrupted view all the way to the snow-capped peaks in the distance under a brilliant blue sky. It certainly beats having to wake up to a view of the next block of flats. And there are few things better than sipping a steaming cup of chai while gazing out of the opening to your tent at 13,000 feet on a crisp Himalayan morning. The Rangdum gompa is small as monasteries go, but its hilltop vantage point commands an awe-inspiring view of the surrounding valley and mountains. The head lama and other monks were welcoming and courteous, and we stayed a while taking in the atmosphere of the place. By now my shoes were bothering me so much that it was almost a relief to take them off to step into the inner sanctum of the monastery. The wind whips mercilessly through the colourful prayer flags fluttering all around the gompa, and it’s a wonder they’re not ripped to shreds and blown away. On we went, higher and higher through the harsh, barren landscape towards Penzi La Pass and the Drang Drung Glacier, stopping for lunch at the edge of a beautiful alpine lake at the foot of a mountain. Penzi La, at 14,400 feet was the highest – and coldest – point on our trip. We set up camp on a slope sheltered as best as possible from the biting wind. But surrounded as we were by valleys on three sides, shelter was a relative word. Standing still was an effort. Still, it afforded the kind of photographic opportunities that would be almost criminal to miss. The pièce de résistance, of course, was the night shot of the Milky Way positioned vertically over the head of the glacier, seeming almost as if the glacier were an earthly extension of the galaxy itself. 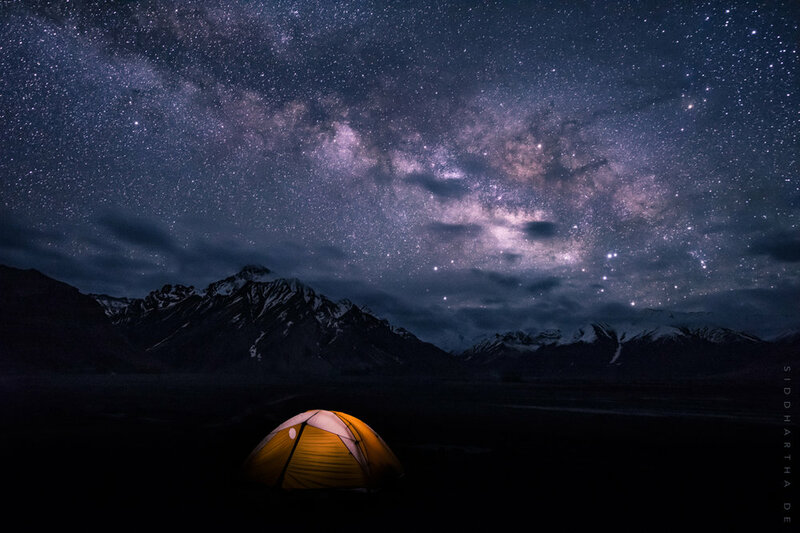 Oh, the skies in Ladakh! To be able to see the Milky Way with the naked eye, to be able to trace it with a finger from horizon to horizon is not something I will ever forget or take for granted. There were so many stars here that I had difficulty identifying the constellations I was familiar with on the plains. Constellations within constellations within constellations. We started back the following morning the way we had come. I would have liked to have gone on further, towards Padum and perhaps beyond, but I’ll have to save that for another time. We backtracked through Rangdum, past the monastery, halting again at the same chai stop, where I asked the proprietor if he had any Fevi-Kwik for my shoes (he didn’t), and then later at Shafat for lunch on the banks of the Suru. In the mid-afternoon, we reached Parkachik, and I jumped out of the SUV at the streetside chai stall to try my luck again. I asked the man behind the counter if he had any Fevi-Kwik. He said no. Fevicol? No. On an impulse: Elfy? Why, of course, I have Elfy! He produced a box for my inspection, and I found that it is the Pakistani equivalent of Fevi-Kwik, brought across the border probably on horseback or on foot! You live, you learn. I bought three tubes of the stuff. We reached our campsite in the late afternoon and started setting up our tents. I worked on my shoes, and the Elfy lived up to the exalted reputation it seems to have in Ladakh. The soles held. I would still have to retire the shoes after the end of the trip, but they would see me through. The sky was overcast and dull, and I didn’t think the evening held any promise as far as golden sunsets were concerned. It seemed like those pictures I wanted of the setting sun painting the mountaintops in rich golden light would have to wait until my next trip. I decided to go for a quick bath in the chilly waters of a small offshoot of the Suru River. I was an appreciable distance away from my tent (and, consequently, my gear), cold, wet and shivering, when the clouds started to part and the setting sun began to bathe the 23,000 foot tips of the Nun and Kun peaks in brilliant golden light. Nobody has ever seen me run like I did that evening, to my tent to grab my camera (which, thankfully, already had my 28 mm lens mounted), and back again to the edge of a pool caused by river runoff. I was still cold and wet, and inappropriately attired, but when you can point your camera at a scene like this, who gives a damn? Did I say you don’t really have a golden hour in the Himalaya? I’m sorry, I take it back. I was still cold and wet, and inappropriately attired, but when you can point your camera at a scene like this, who gives a damn? The skies eventually cleared completely, and we had another productive session of night photography after dinner. We went to bed tired but happy that, all said and done, it had been a special trip. We had come for the pictures, but we ended up getting so much more out of the experience. The next morning we packed up all our gear for the long drive back to Leh. As we drove back through the Suru Valley, I saw once again the little mountain streams of snow-melt flowing into the Suru, which along with the Zanskar empties into the mighty Indus, on its long and arduous westward and southward journey through the Himalayan gorges and valleys down into the great plains of the Punjab, the granary of India. It all starts up here in the high Himalaya. I didn’t get to spend much time in Leh itself. I’ll do that on my next trip. Just one evening strolling through the busy marketplace doesn’t do this town justice. It’s funny how easily you can be a foreigner in your own country. Ladakh is almost certainly the coldest corner of India, yet Ladakhis are some of the warmest and friendliest people I’ve ever met. The place felt so far removed from the familiarity, noise and bustle of the big cities further to the south that I spend most of my time in that I often had to remind myself that I was still in India. Everyone here had something to offer, something to give, even when he or she didn’t have much. A bowl of dzo yogurt. A little local knowledge. A smile at the very least. 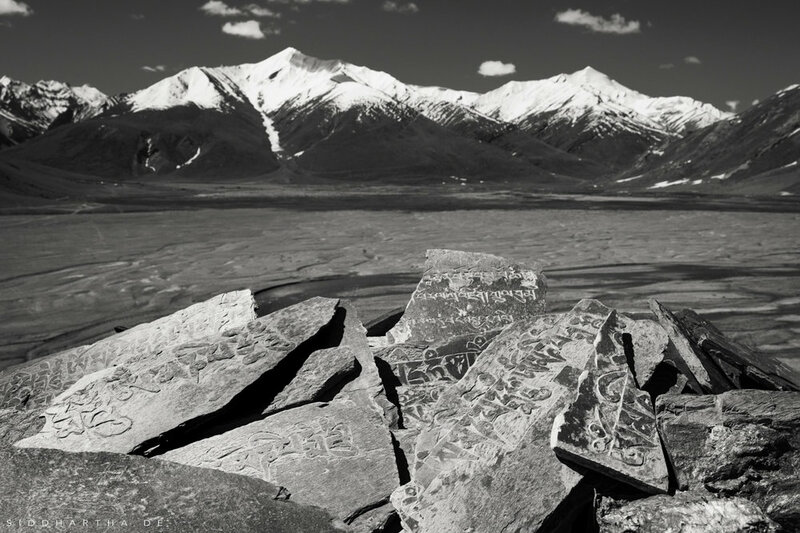 Ladakh is not a one-trip destination. A few days was never going to be enough. There is so much more to see, so much more to experience, so much more to learn. I learned how small and insignificant we really are when we’re in these mountains. I learned that jugaad will always be ingrained in the Ladakhi psyche. I learned that Elfy is bloody brilliant. I learned that Maggi noodles don’t taste nearly as good on the plains as they do at 14,000 feet! I learned that the locals place a stone on chortens around the valleys, mountains and passes so they may return safely one day to the same spot they had placed the stone on. And I did the same so that I may return again someday to the Virgin Vale. What a trip! And to think that, through it all, the only damage I sustained was a mangled shoe and a sunburned nose! I’m going back!